Invicta FC 19: Maia vs Modafferi Results (photos) » MMA H.E.A.T. 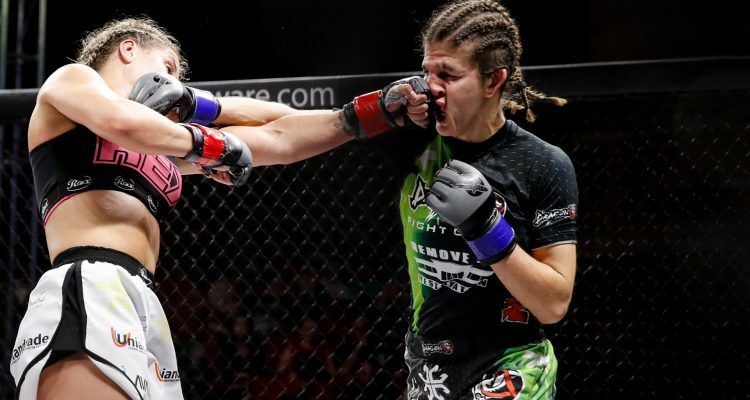 On Friday, September 23, Invicta Fighting Championships hosted Invicta FC 19: Maia vs Modafferi from the historic Scottish Rite Temple in Kansas City, MO. The show was headlined by newly crowned interim flyweight champion Jennifer Maia (14-4-1) who defended her belt against Roxanne “The Happy Warrior” Modafferi (19-13), defeating her via split decision. In the co-main event, Japanese star and atomweight champion Ayaka Hamaski (14-1) defeated Jinh Yu Frey (5-2) via TKO in round 2. The event was streamed live and exclusively on UFC Fight Pass. +Van Duin missed weight and was fined 25 percent of her purse. No Comments on "Invicta FC 19: Maia vs Modafferi Results (photos)"